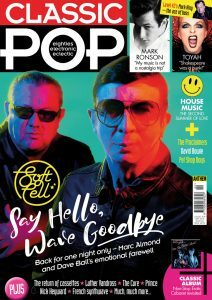 Issue 44 of Classic Pop magazine, which includes a six-page Toyah feature, is on sale now. The feature includes a new interview with Toyah and a selection of career spanning images. This month, we also look back on the glory days of house music and Toyah tells us how she brought the punk aesthetic to the pop world. Look for the magazine with Soft Cell and Toyah on the cover. Click the magazine cover below to visit Classic Pop’s website with mail order and subscription options.